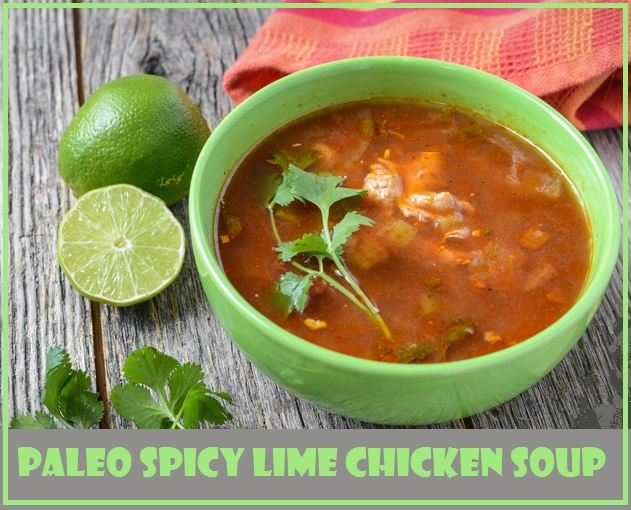 Paleo Spicy Chicken Soup Recipe with Lime - Yum! 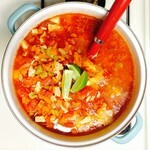 This Paleo Spicy Chicken Soup is delicious and comforting. So if you are looking to spice up your meals with an easy dinner that will make everyone oh and ah but takes almost no timeto prepare, this is a meal for you! I love cooking a whole chicken in the crockpot over the weekend, making bone broth with the bones, and then using the broth and the chicken meat for this soup. It’s great to have on hand for breakfast, lunch, dinner or even for snacks. Keeping something on hand throughout the week that satisfying and nourishing can be a serious lifesaver when you’re hungry and too lazy to cook (which pretty much describes me 99% of the time!). It also freezes and reheats well if you like to batch cook and stock some up in the freezer. You never know when someone in the family comes home famished and this is the perfect thing to heat up for a quick and easy meal for one. In the bottom of a large soup pot, sauté the onions and garlic in oil or butter. Once the onions are translucent, add in all other ingredients except for the chicken. Stir until well mixed, bring to a boil, and then lower the heat and let simmer until vegetables are soft. Add the chicken and continue cooking for 5-10 minutes, until hot. Feel free to play around with the spices and heat level. Sometimes I add even more hot sauce. Garnish with cilantro or avocado, or both, and enjoy!